The Aries lookbook opens with a Curriculum Vitae of sorts – the words of designer Sofia Prantera, detailing her journey towards co-founding her new streetwear venture with fellow fashion head Fergus Purcell. Prantera was the driving force behind cult brand Silas, pioneering its idiosyncratic style in the mid-90s. Purcell, meanwhile, designed the iconic logo at Palace Skateboards; he more recently had a hand in Luella Bartley and Katie Hillier’s motocross-inspired – and much lauded – Marc by Marc Jacobs reboot for AW14. They've known eachother since the early days, working together at Slam City Skates: “Life was so slow then”, Sofia muses, “everyone just hung out.” Her nostalgic reference to the way things were reminds us with a jolt of the way things are: a clothing label's lookbook, emblazoned with a smashed smartphone screen, decreeing with a shout ARIES ARISE. This tension – between our constantly buffering, trend-led present, and the anti-fashion movements of our communal pasts – is what informs Aries, the high fashion-meets-streetwear label from the dreamy design duo. The pair are riding the crest of a whole new wave of street wear in 2014, and their profile is on the rise. So what can we expect from the maverick label from two of the most sought after streetwear designers in fashion? When Prantera’s expert eye combines with Purcell’s idiosyncratic graphical style, the result is a capsule collection that sits neatly between high fashion and streetwear norms, challenging both all the while. We spoke to Prantera and Purcell about the cult of the logo, blending subcultures and how to be unfashionable. Describe the vision behind Aries? What is that name all about? Sofia Prantera: It was Fergus's job to come up with a strong name for the brand. Ferg is amazing with words and slogans. He's an Aries, that's why (I am a Taurus on the cusp of Aries, so I'm not too slouchy in that regard either). Fergus Purcell: The qualities of the star sign – of coming first, being a leader, having a strong creative drive and so on – seemed to be appropriate for a brand. I also liked the unfashionable (hippy) connotations of naming the brand after a star sign. Sofia Prantera: In the Woody Allen film Sleeper there is a sinister government plot called "The Aries Project." Ferg always thought this would be an amazing name for something. Would you associate Aries with a particular subculture, or era? Sofia Prantera We were both teenagers in the 80s, so perhaps all the subcultures from that time had an impact on us, and have left a lasting influence. Particularly in the way that, at that time, each of the subcultures had its distinct tribal costume. There was the idea that the clothes you wore could instantly signify what you felt you belonged to, what your values were, what music you listened to and so on. Fergus Purcell: There's something about this idea – that clothes are imbued with powers beyond merely their material surface – that is really attractive. Having said that, we're not anchored in any particular time, decade or subculture. As you can see from the book, we're totally absorbed in the now and fascinated with the multi-layered look of the contemporary cyber world. When did you both meet, and in what context? Fergus Purcell: We met at Slam City Skates. Sofi was already working there having started on their short-lived in-house clothing label. I'd just graduated from college, and having occasionally done artwork for Slam City it was the first place I looked to for work. They were starting a new clothes label – which was called Holmes – and they engaged me to work on that. 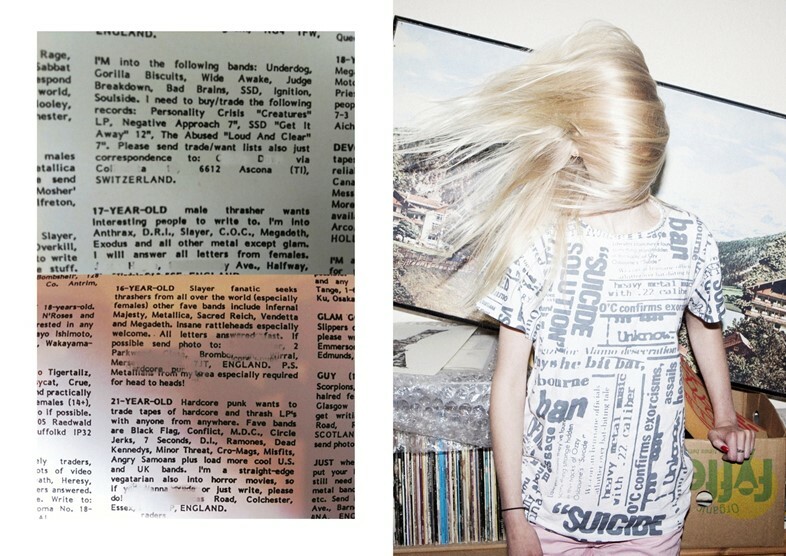 Sofia Prantera: In the look book I wrote a short story of how we met. Ferg just arrived in Slam City one day. It was before everyone had mobile phones, and Ferg would just appear every now and then bringing new graphics and artworks. A lot of them were never used and I have kept most of them. My favourite was a comic called Little Fucker. I loved comics. We have been friends ever since. Your fashion contributions leading up to Aries have also focussed on logos and slogans, emblazoned on your designs at brands such as Palace skateboards and Silas. Why are you drawn to these “signifiers of subcultures” – this cult of the logo? What messages do logos convey in fashion today – is there more to it than branding? Fergus Purcell: Humans are perpetually in love with symbols; the monograms of contemporary brands harness the same power that was first explored through cave painting, and then later in hieroglyphics and alphabets. It's the idea of encapsulating a potentially complex thought in a very simple and direct symbol. It seems to be in our collective memory to respond deeply, instantly and spiritually to these symbols. As for fashion's use of logos, it's very multi layered – symbols are used boldly, ironically, ignorantly. Even all these contradictory things at once; such is the power of the logo and such is it's enduring appeal. These symbols can be re-invented and played with in endless ways. Sofia Prantera: I have often been asked why I never had a desire to design under my own name. My ambition was to create a brand, and the logo is an integral part of it. As Ferg said, it's a symbol that encapsulates your ideas and purpose and that can live on after you. It can be extremely powerful and goes beyond fashion and clothes; it represents your branding, your intentions, the lines along which you conduct your business. Look at the way the McDonald's logo, for example, has been used – first by the artists Jake and Dinos Chapman to simultaneously condemn and celebrate corporate culture, depicted as an omnipresent symbol in their hellish dioramas, and then recently by Jeremy Scott as a rebranding tool for his McDonalds-meets-Chanel debut for Moschino AW14. What are your thoughts on the uptake of idiosyncratic streetwear styles by multi-national fashion corporations? Fergus – you have worked with Marc by Marc Jacobs, for example. Does streetwear inject new life into designer corporation signatures? Fergus Purcell: I am so glad that fashion has once again become interested in streetwear and in the graphics that come with it. There should always be a connection between what goes on in the ivory towers of the design houses and what people are actually wearing on the street – this conversation goes back and forth and is enlivening. The idea of austere aspirational luxury fashion, without anything to temper it, is depressing to me. I like the noise and the brashness and the irreverence of the fashions that come from the streets. Sofia Prantera: The clash between streetwear and high fashion is the quintessence of Aries, it constitutes its very heart, and has therefore been a big inspiration for us. In the past I have struggled to reconcile my love for fashion and beautifully made and cut clothes with my love for street wear and anti-fashion youth movements. Now it seems to have fallen seamlessly into place. The lookbook is interspersed with glitched-up images of both our communal digital present (a smashed smartphone screen, recently used emojis) and our communal analogue pasts (music sheets, sci-fi books, lonely hearts ads for metalheads). Why this aesthetic, and do these opposing tensions inform the collection? Fergus Purcell: The phenomenon of something that is utterly up-to-the minute being consumed alongside something that is 50 years old is actually the way that everyone experiences culture now – it's a very contemporary point of view, and is not something that is unique to Aries. Sofia Prantera: I think it's how we're all living – and so, yes, it absolutely informs the collections. It's something that we really enjoy and celebrate. 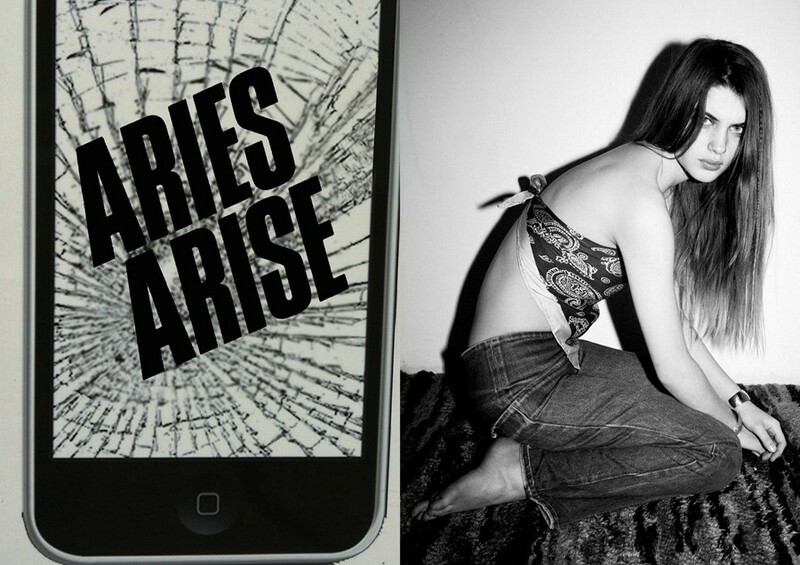 Your current collection asks us if we are “bourgeois or bizarre.” Is Aries both?